Do you love hummingbirds? Maybe a better question would be, who doesn’t? Hummingbird feeding from an ocotillo flower. Attracting hummingbirds to your garden isn’t hard to do by simply adding flowering plants, rich in nectar that they are attracted to. Female Anna’s hummingbird at my feeder. But, what if your garden space is small or non-existent? Is a hanging a hummingbird feeder your only option? Well, I’m here to tell you that space needn’t keep you from having your own hummingbird garden – all you have to do is to downsize it creating one in a container. If you have a small patio, stoop or even a balcony, you can create your own mini-hummingbird garden in a container. For those of you who have think you have no space at all, look up! Hanging containers or window boxes are a great option for those short on garden space. Whether you have small garden space or simply want to increase the amount of hummingbirds visiting your existing garden – creating a mini-hummingbird garden in a container is a great way to do it. – Select a location that receives at least 6 hours of sun a day. – Group containers together for greater color impact, which increases the chances of hummingbird visits. 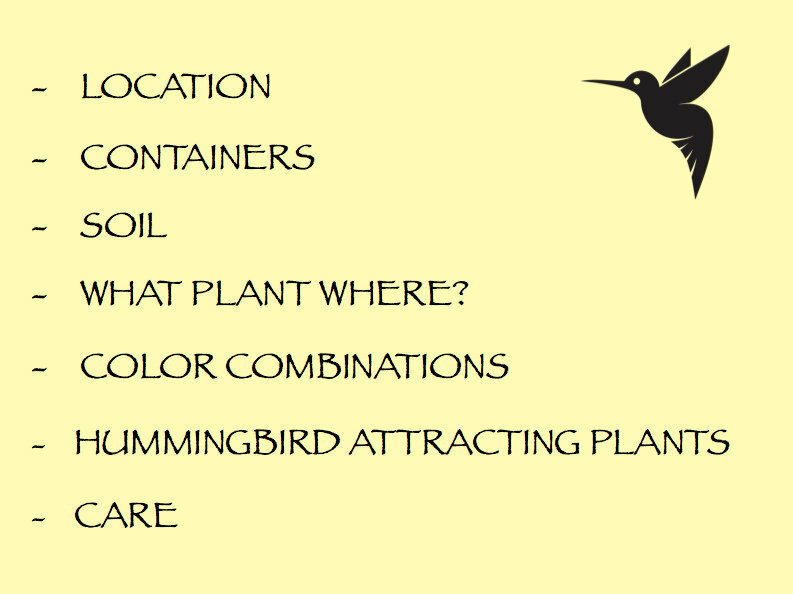 – Place containers in areas where you can view the visiting hummingbirds such as an entry, near a window or a back patio. – Make sure that the containers are visible and allow easy access for hummingbirds to fly in and out. – The type of container isn’t important – but drainage is. Make sure pots have holes for drainage. 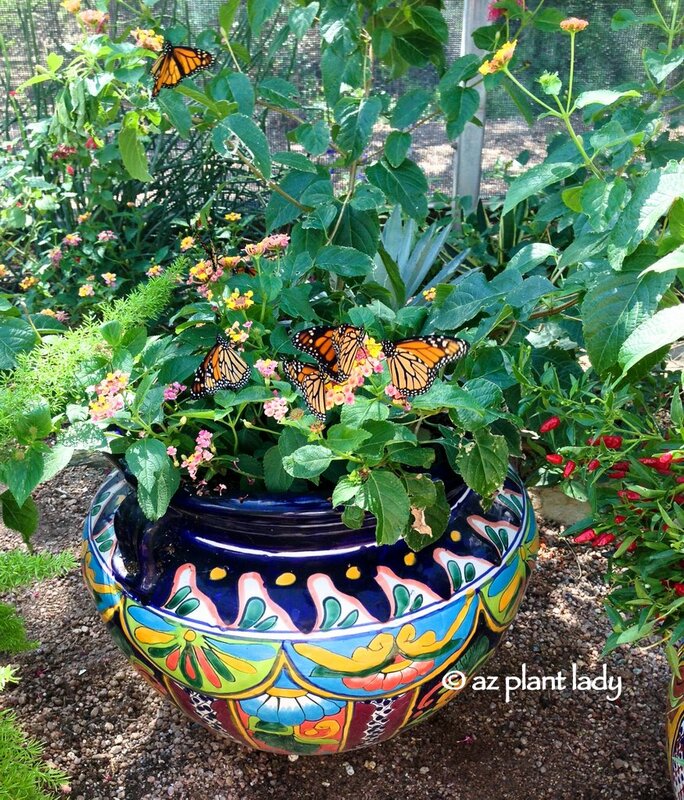 – Select colorful pots for a welcome splash of color (optional). – Larger pots will stay moister longer, therefore needing to be water less frequently. – Use a planting mix (not potting soil), which is specially formulated for container plants since it holds onto just the right amount of moisture without becoming soggy like potting soil can. – For large containers, save money on expensive planting mix (soil) by filling the bottom third of the container with recycled plastic water bottles and/or milk jugs. While hummingbirds don’t care how you arrange plants in your mini-hummingbird garden – you can certainly arrange plants. 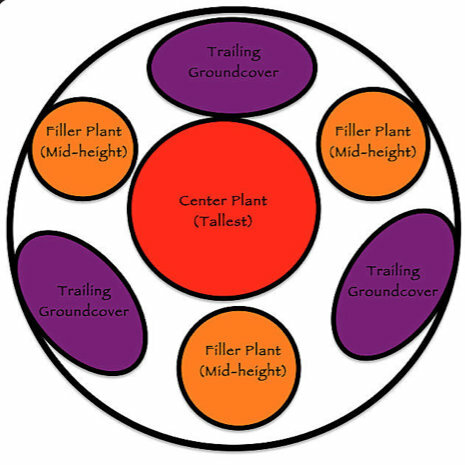 – Place the tallest plant in the center, surrounded with medium-sized filler plants interspersed with trailing ground covers. This planter has the tallest plant (Salvia) located in the center with mid-sized purple coneflower next to it with ‘Wave’ petunias spilling over the outside. A hummingbird’s favorite color is red, although they will visit flowers of all colors as long as they are rich in nectar. However, let’s explore color in regards to creating a beautiful container and figuring out what color combos look best. To this, we will need to visit our friend, the color wheel. 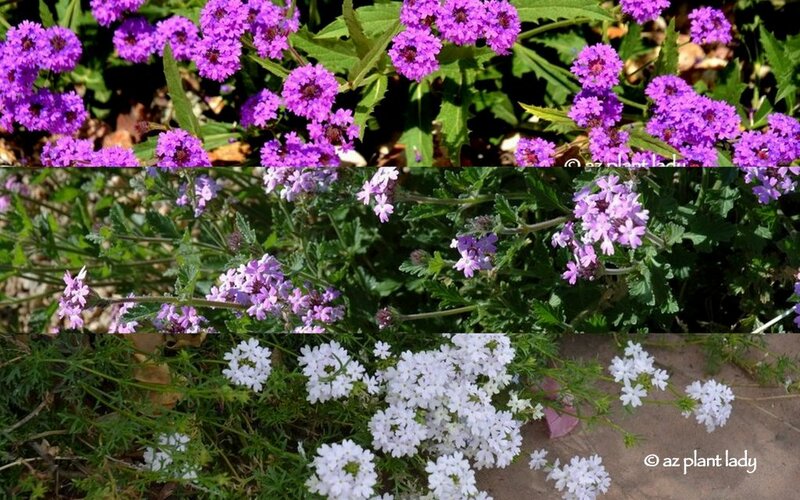 – To achieve a soft blending of colors, select plants with flower colors that are next to each other on the color wheel. – For a striking contrast, pair flowers with colors that occur on opposite ends of the color wheel. – Hummingbirds are drawn to flowers that have a tubular shape. 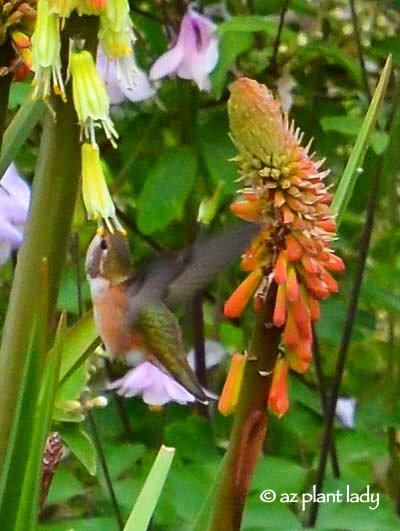 Hummingbird feeding from the yellow flower of aloe vera. – The color red is their favorite, but as stated earlier, they will visit flowers of all colors. Young hummingbird feeding from a lantana flower. – They tend to prefer flowers with little to no fragrance since their sense of smell is poor. 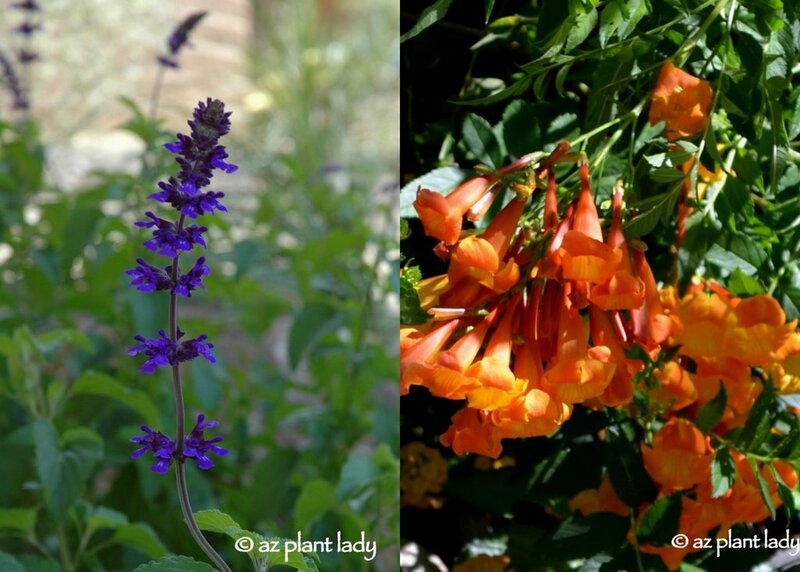 – Plants belonging to the Salvia genus are all very popular with hummingbirds and are a safe choice when creating a hummingbird container garden. – Flowering succulents are also often visited by hummingbirds as well. Rufous hummingbird feeding from the flower of a red hot poker plant. – Other helpful resources are your local botanical garden, master gardener or nursery professional. Another bonus to planting hummingbird attracting plants is that many of the same flowers attract butterflies too. The key to maintaining healthy container plants lies in proper watering and fertilizing. – Water containers when the top 2 inches of soil are barely moist. You can stick your finger into the soil to determine how dry the soil is. – Water until the water flows out the bottom of the container. – The frequency of watering will vary seasonally. Fertilizing is important for container plants – even plants that don’t normally require fertilizer when planted in the ground will need it if in a container. – Fertilize with a slow-release fertilizer, which lasts 3 months. – Supplement, if desired, with a liquid fertilizer monthly. – For succulents, use a liquid fertilizer at 1/2 strength every other month spring through early fall. Don’t be afraid to look outside the box when it comes to what can be used as a container. An old wheelbarrow makes a great container after a making a few holes in the bottom for drainage. *While marigolds don’t attract hummingbirds, there are a few dianthus in this planter that do. Add a water feature in a container that will surely attract nearby hummingbirds. Add places for hummingbirds to perch nearby or within the container itself. This little black-chinned hummingbird was perfectly at home perching on a lady’s slipper (Pedilanthus macrocarpus) stem that was growing in a container. You can always add a small, dead tree branch within the container itself for a convenient perching spot. As you can see, the amount (or lack of) garden space doesn’t need to limit your ability to attract hummingbirds using beautiful, flowering plants. I spoke about small space gardening at the Hummingbird Festival 2015, and it was an unforgettable experience, filled with educational talks, beautiful gardens and observing hummingbirds up close – I even got to hold one! To read more about my adventures with hummingbirds, click here. I hope that you are inspired to create your own mini-hummingbird habitat in a container. 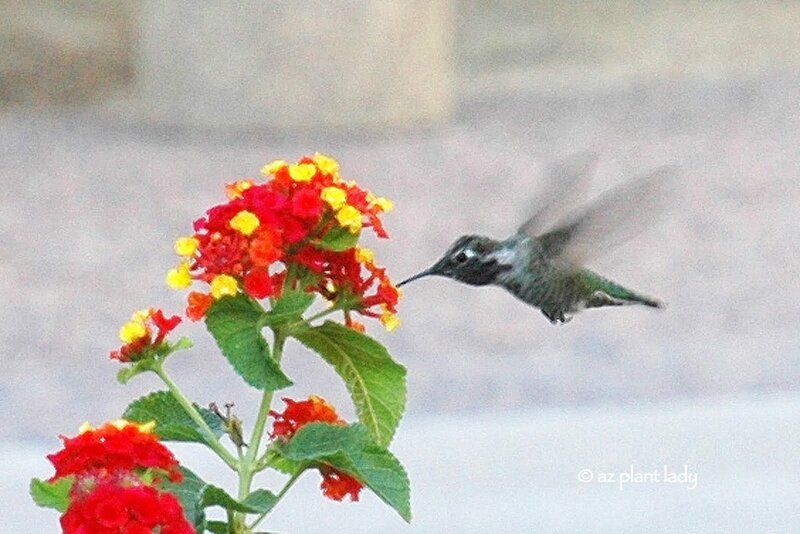 **Do you have a favorite plant that attracts lots of hummingbirds? Please share them in the comments section. Last week, I was cleaning out old files that I had stored in a box from my years working as a horticulturist on golf courses, and I found this photo of me standing in a bed of wildflowers. It was taken during my first year after graduating with my degree in horticulture in 1999. Throughout the golf course, was feature areas and I took this empty one and planted wildflowers including succulent lupine, red flax, and desert marigold (not blooming yet). When I look at the picture, it brings back many memories of garden victories, along with a few failures – I call that life (garden) experience. *What were you doing in 1999?